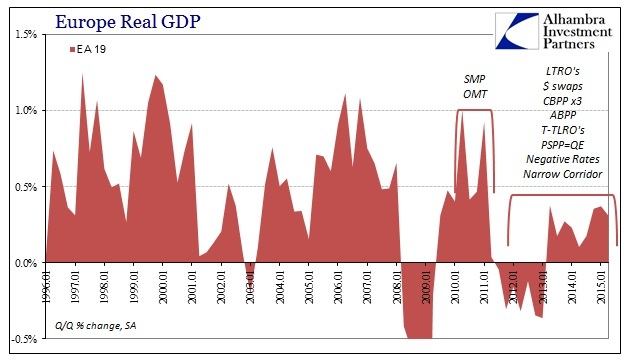 European GDP disappointed for Q2, which was only surprising to those expected something out of QE. At +0.3% (Q/Q), the European economy is clearly stuck in the same mindless rut that has taken hold since the 2011 crisis re-flaring. While recent convention holds, in light of this year’s QE, that the ECB has been idle during this time that simply isn’t true. 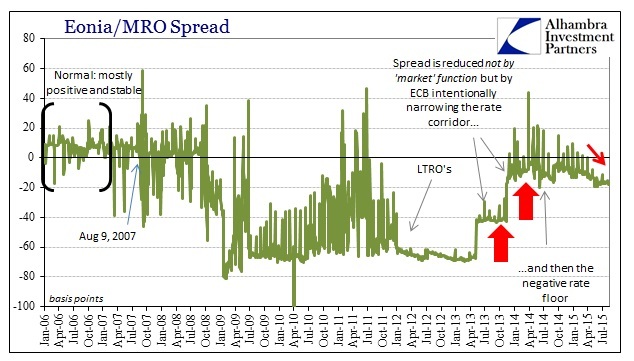 Since 2011 (and really May 2010 with the first “buying” program) the ECB has intervened every which way possible. QE is really just a continuation of the same via a different methodology. Just in the past year, the ECB’s heavy hand is obvious. 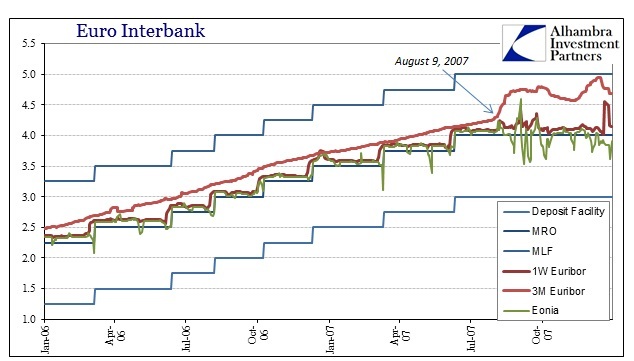 Interbank markets are completely upended as if that form of monetarism was tautological. This was pure experimentation, particularly as rates sunk below zero. The effects of all that are certainly debatable, though seemingly deliberated against by the very fact QE was implemented not long thereafter, but what is not in doubt is that monetarism has been a constant feature in Europe for years now with increasing emphasis. 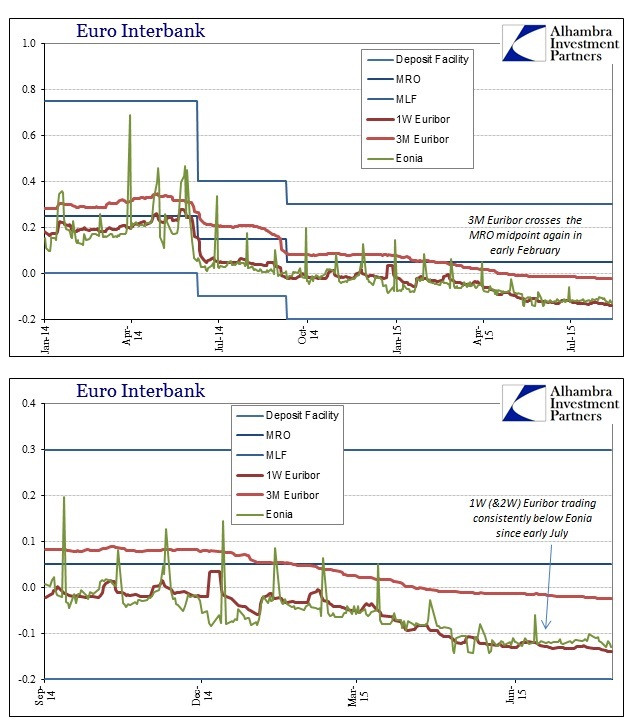 In the euro area money market, the decline in interest rates had been limited, despite the large increase in excess liquidity. The EONIA had averaged -11.8 basis points since the beginning of the current maintenance period, compared with -9.8 basis points in the previous period. Overall, short-term money market rates had remained broadly stable, unaffected by the re-pricing in bond markets and by the uncertainty related to Greece. 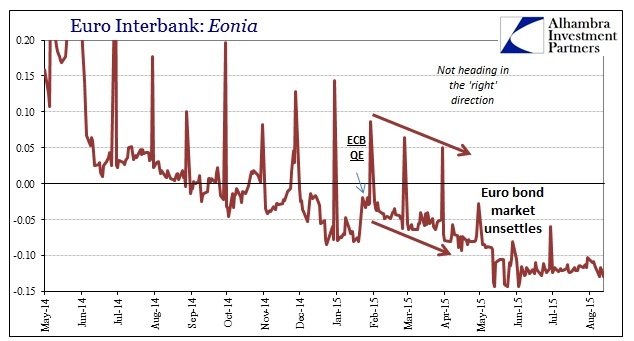 Eonia may seem settled to the ECB, ignoring its plainly irregular pattern after April and how the bond market went crazy at the same time (Greece or not as a catalyst), but even their bland interpretation doesn’t hold past that. One-week and two-week Euribor are now trading consistently below Eonia (which is overnight) as the rest of the Euribor curve sinks and flattens down. So even in that narrow perspective where the ECB is clearly looking for some positive confirmation of its work as stability it doesn’t sustain beyond the most superficial. A return to expansion in France and Italy helped boost eurozone economic growth in the first three months of 2015 to its fastest pace in nearly two years, raising hopes that an uneven recovery is finally broadening in long-stagnant Europe. While Germany saw growth accelerate to 0.4 percent from 0.3 percent in the quarter before, France saw no growth at all following a strong 0.7 percent rise in the first three months of the year. “France appears to have relapsed into its role of the sick man of the eurozone,” said Chris Williamson, chief economist at Markit. The disappointment wasn’t confined to France. Italy, the eurozone’s third-largest economy, saw growth dip to 0.2 percent from 0.3 percent — far too little if it is to make up for recent years’ declines. The mood among analysts and investors in Germany worsened in August due to concerns about the effect of an unstable global economic backdrop on the country’s export-dependent economy. Whatever the immediate interpretations, the larger pattern remains undeterred – and that is the problem. No matter what the ECB does, Europe’s economic growth is at best mired in near nothingness while at worst it falls in and out of recession particularly in the countries not named Germany. This disparity is even worse when looking at nominal GDP, which is supposed to be the mechanism for all this monetary transformation. After all, every central bank “expansion” is supposed to play on “inflation” expectations to at least get nominal growth moving forward (orthodox economics just assumes that transactions, even if inflationary, will lead to actual and sustained growth). 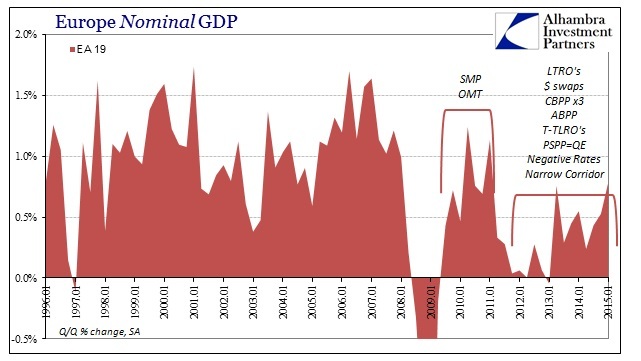 But, again, nominal GDP shows no positive sign of the ECB’s transgressions either. This isn’t surprising since the euro as a global “reserve” and the “dollar” as a global “reserve” are highly linked by the global banks that participate in both. It is beyond naïve to think that banks under strain in eurodollars, which means their liability structure, wouldn’t transmit those inabilities to the other currency denominations on that same liability side. Wholesale banking, shadow banking or whatever anyone wants to call it, is failing but the eurodollar side is more noticeable given its much wider and broader reach globally. 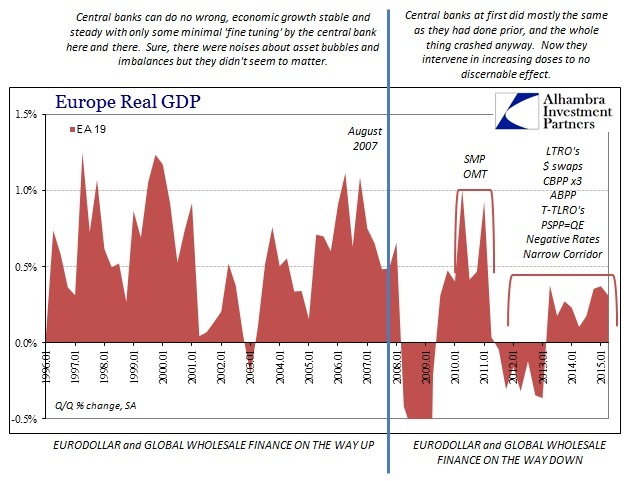 Like the Fed, the ECB did comparatively little before August 2007 and everything seemed to work (ignoring, as they certainly did, the asset bubbles); thereafter nothing has no matter how much or how hard the central bank disrupts various features and functions. It was never central banks to begin with, except in that they fooled everyone, and themselves by taking credit for the financialism, into thinking they were wholly in control when instead they were, and still are, just along for the ride. These economies were built intentionally on debt at the margins (credit-based “money”), so without that financial element they just go nowhere (and worse) no matter how much or what type of “stimulus” is unleashed.